When it boils down to making a landing page it can be a huge task. Not to mention generating sales leads. With Online Sales Pro you can easily make a landing page with their lead generation and sales software platform. What I want to investigate here, is Online Sales Pro a scam? Online Sales Pro is a lead generation and sales software platform that has many resources and tools to automate your marketing efforts. The owners of this platform are called Grady Polcyn and Joel Kellman, not Vincent Ortega Jnr. as many other reviewers of this system have stated. I must admit though that Vincent Ortega does get some royalties from Online Sales Pro as the former owner. The platform itself is not unique as there are other software platforms that have similar software. As in Clickfunnels, Lead Pages and My Lead System Pro. In choosing between them its all a matter of where you are in your online marketing. Are you a beginner? an intermediate? or a professional? Whichever you believe you are will lead you to the exact system that is right for you. If you do your research. Getting back to Online Sales Pro. This platform will build ad-friendly mobile responsive landing pages with easy to use pre-built customizable templates. It has a simple 3rd party integration with four of the popular autoresponders. Which are listed below. The real beauty about this system is the mobile app, whereby you can obtain real-time lead notifications that you can call, text or email. The system tracks everything in real-time and sends out push notifications every time it collects a lead or generates a sale for you. The system comes with 2 pricing platforms. Each has different features depending on which platform you chose. There is an upsell to the MVP platform but I don’t think it is necessary personally. Online Sales Pro is very easy to use. You can be up and running in 3 simple steps. All 3 of these steps are outlined in short videos. Simple! Although the commission structure below outlines 30% and $40%. The introduction video states it as 54%. Commissions are paid by PayPal or a mailed check. The option to receive commissions by check is only available to U.S.-based affiliates. They also provide links, OSP affiliate training and 3rd party funnels. Manage and automate follow-ups with your leads by using OSP’s click-to-text or click-to-email feature. Real-time contact and lead management. Create unlimited mobile-friendly landing pages from the pre-built templates. The simple-to-use system takes no time to get your page updated and saved. Customize any page to your product or business by adding images, texts and videos easily within the Quick Editor. 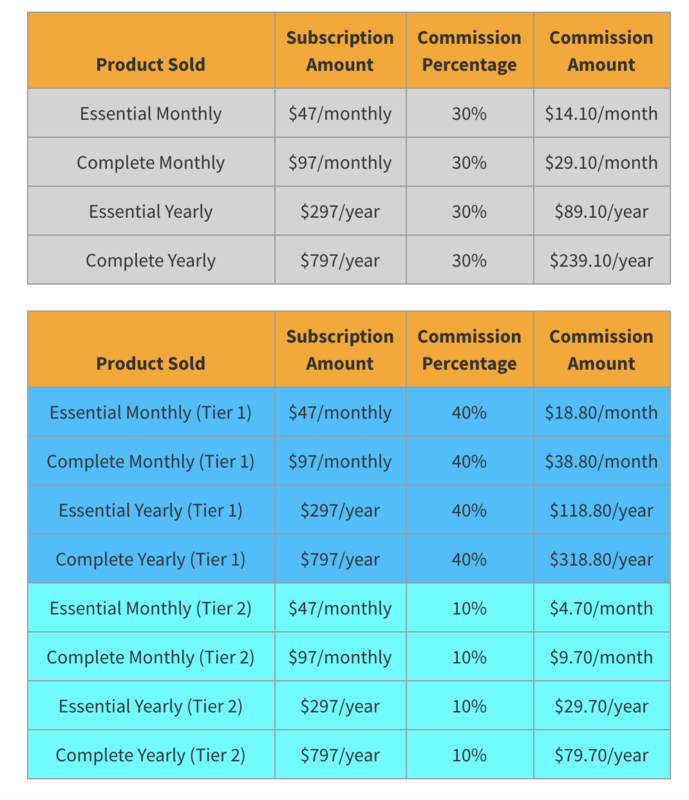 The Online Sales Pro membership pricing is quite reasonable. A subdomain is something you will create when you sign up for Online Sales Pro to set up your marketing websites. The section of the link below that says “easy” is what you are setting up. Whatever name you choose is entirely up to you. Some people use their business names, and some their personal names, and still others use a more generic term or word that has significance for them or their business. Online Sales Pro has a 30-day money back guarantee as stated in their video. Their website differs and says there is a 14-day money back guarantee. Whichever it is it is a sure sign of a legit program. The support system is fantastic you can email or phone directly on an 800 number. This is a shame as one-third of all websites in the world are made by WordPress. Online Sales Pro can only integrate with 4 autoresponders – AWeber, ActiveCampaign, GetResponse and MailChimp, which is really limited. The customization of this program is quite limited. I cannot find any ugly sides to Online Sales Pro platform. All in all, I believe that Online Sales Pro is a legitimate business platform. Online Sales Pro is definitely NOT a scam! OSP has quality landing pages, sales funnels and relevant training to help online marketers generate more leads and sales for their businesses. I found it to be a genuine business model. I would love to know if you have had any dealing with Online Sales Pro. Keep me informed and drop me a line if you are a member of this program. You can contact me either in the comments area or the contact form or ask me form. My Mobile Money Pages Review – Scam or Legit?